There’s a lot to be said for Benjamin Franklin’s saying – “Early to bed, early to rise makes one healthy, wealthy, and wise.” Getting the required amount of sleep your body needs each night is one of the best ways to maintain a healthy metabolic rate, not to mention slow the ageing process while you’re at it! The amount of sleep your body requires can vary from person to person, but for most people the best part of 8 hours a night tends to be ideal in order to fully reboot. Our body uses the time we’re asleep to go to work recovering from the stresses and strains of the day, in preparation for the next – a little like refueling the car at the gas station – so when we get less sleep than our body needs we accumulate what’s referred to as a ‘sleep debt’. Every time you get less sleep than required, the sleep deficit or debt accumulates and the bigger it grows, the harder it is to pay back. What’s more the hours sleep we accumulate before midnight are the most beneficial because they account for double the hours we get past midnight. This is related to the activity of our stress hormones – cortisol and adrenalin – which reach their lowest point around midnight when our body is supposed to be asleep and slowly starts to rise and peak by 8am, when we need to be alert and stimulated for the day ahead. But when we push our body to stay up past 12 am, our body is forced to stay stimulated and it will do this through the production of excess cortisol, rather than winding down and regenerating for the next day. This is where long term sleep deprivation – or accumulating a sleep debt can impact on our metabolic weight. I wrote a previous post on how stress can damage your metabolic rate and long term sleep deprivation is form of stress to the body. Another reason chronic sleep deprivation can impact on our metabolic rate, (leading to subsequent weight gain), relates to our liver activity. Around 6pm each day our liver function begins to slow down in preparation for storing glycogen – (stored glucose) for energy use the next day. When we stay up late at night, we force the liver to delve into our glycogen reserves, depleting our energy stores for use the next day. In these instances our body is forced to release stress hormones from our adrenal glands to keep us going. These hormones also accelerate our heart rate, increase our blood pressure, and suppress our immunity – leaving us more susceptible to infection from colds and flu. The combination of excess stress hormones and too little glycogen (stored glucose) causes us to crave sugar. If you indulge in sweet / high sugar carbohydrates at night, the excess load of sugar dumped into the blood stream, overstimulates our pancreas to produce too much of another hormone, insulin – especially if you eat these foods on an empty stomach. Excess production of insulin causes our cells to absorb too much sugar causing hypoglycaemia – low blood sugar. Hypoglycaemia causes us to feel tired, irritable, and lightheaded as well as crave more sugar- and so the vicious cycle repeats itself throughout the entire day, as we oscillate between continuous sugar highs and lows. You may recall in another post I explained how sugar is more fattening than most fats. So if your goal is to sheds some excess pounds, consider your sleep patterns as part of a healthy weight loss plan. A sleep debt cannot be repaid in one long stint, eg: sleeping in 3 extra hours on a Sunday, after a week of sleep deprivation. 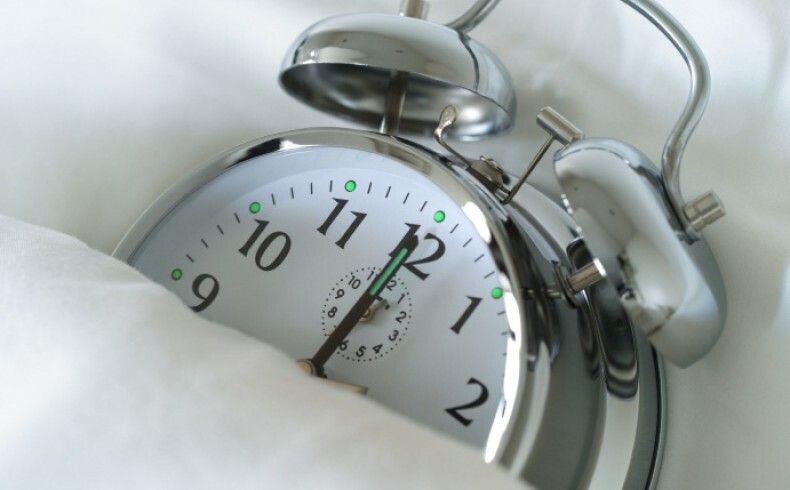 The best way to pay off a chronic sleep debt is to tack on an extra hours sleep each night. Listen to your body by going to bed when you are tired rather than pushing through or taking stimulants such as coffee to stay awake. Fatigue is the body’s way of signaling it has run out of juice and needs sleep to restore. When you reach a point of waking naturally (without the need for an alarm) and feel refreshed – without the need for coffee to kick start your engine, you know you have paid off your sleep debt. Expect to sleep upwards of 10 hrs each night when recovering from a chronic sleep debt. As the days pass the amount of time sleep will gradually decrease. This may take weeks to months. Avoid stimulating activities past 8pm – this includes using computers, speaking on the mobile and engaging in deep conversations. Even watching TV can be over stimulating for some. Avoid drinking coffee or black and green tea past lunch time. Avoid eating within three hours of going to bed and eat a lighter meal in the evening such as soup and salad or fish and steamed or stir fried green vegetables.